I love to support our BC wineries. I watched over the many years as the number of wineries has grown as well as the quality improved. Wine critics from here as well as around the world, have tasted our wines, celebrated the quality, and told others. Now you can find BC wines around the world, from Hong Kong to London. 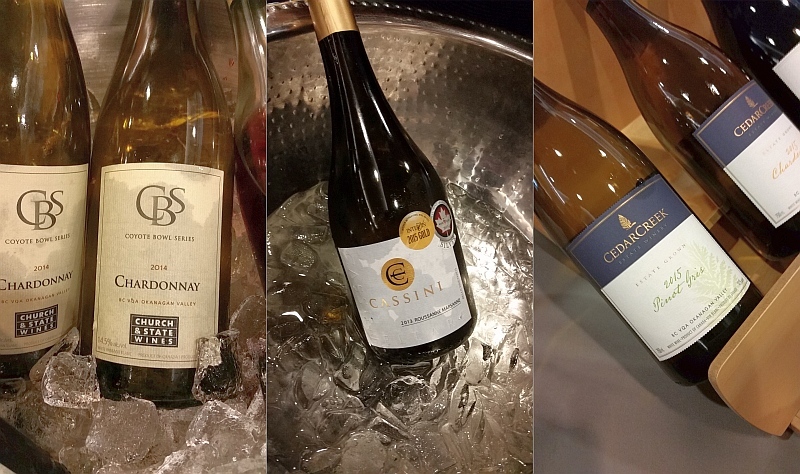 Recently the latest BC VQA vintage releases were available for tasting, and I was one of the Trade invited to try the wines and pass my reviews and recommendations on to you. 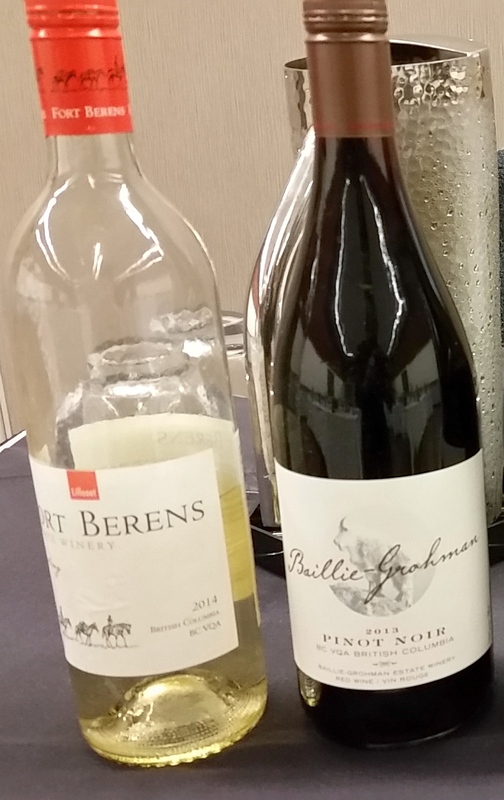 I started off tasting through our white wines for quite a while, and then spent a little time on our reds. So you may see below more recommended white wines, but I’m sure if I did have more time to taste the red wines, this list would be much longer. C.C. Jentsch Cellars The Quest 2015 ($16.09) – Located on the Golden Mile Bench in Oliver, BC, the Jentsch family has been farming in the Okanagan since 1929. The Quest is a blend of Chardonnay, Viognier, and Gewurztraminer grapes. This wine had a light, ripe stone fruit nose. Dry, but supple, with higher acidity. Stone fruit and some citrus rind on the palate. A very nice, food friendly wine. Cassini Cellars Marsanne Roussanne 2013 ($21) – A blend of 40% Marsanne and 60% Roussanne grapes, this wine had light tea leaves aroma. Dry, round, medium bodied and medium acidity. More tea leaves,and also mint and apple flavours on the palate. CedarCreek Estate Winery Pinot Gris 2015 ($17.99) – Medium intensity stone fruit nose. Medium body and acidity with some minerality. Tasty stone fruit flavours on the palate. Very good quality. Church and State Wines Coyote Bowl Chardonnay 2014 ($23.39) – Nice citrus, tropical fruit and oak on the nose. Medium plus body, heavier mouth feel, with ripe tropical fruit and butterscotch flavours. Spicy finish. Pair with Thanksgiving turkey? Inniskillin Okanagan Vineyards Reserve Pinot Gris 2015 ($24.66) – Inniskillin is Canada’s original Estate Winery, and have wineries in both Niagara-on-the-Lake and in the Okanagan. This wine had a light stone fruit and honey nose. Medium plus bodied with round mouth feel. Tropical fruit and honey on the palate. Inniskillin Okanagan Vineyards Discovery Series Chenin Blanc 2014 ($15.74) – I believe this wine is only available at the winery, so if you make it to the winery, please try it and buy it. Chenin Blanc is a very versatile, and food friendly white grape. It can be used for sparkling wine, dry and sweet wines. Very aromatic in the glass with aromas of tea leaves, ripe stone fruit, melon and honey. Fuller bodied, round and soft. Medium acidity. Stone fruit, in particular peach flavour, with honey on the finish. Chenin Blanc is also one of those white wines that can age well, so stock up and enjoy over many years. Intersection Estate Winery Reserve Viognier Marsanne 2013 ($21.69) – Light, flinty nose. Medium plus body, round and smooth. Medium acidity. Red apples on the palate with sweet spices on the finish. 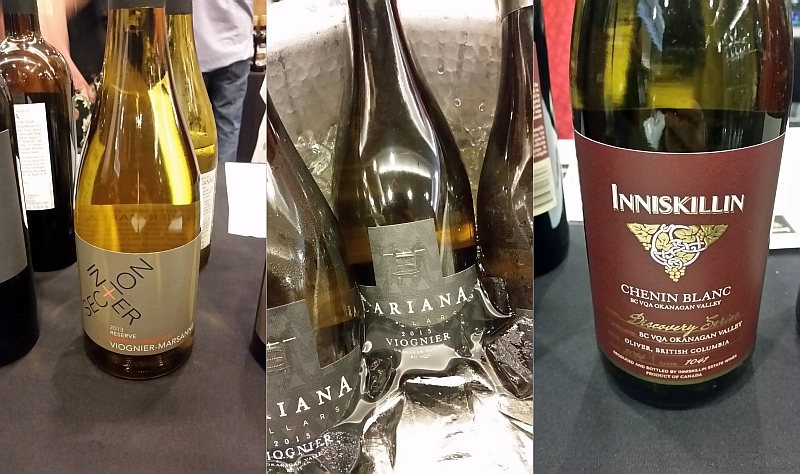 Lariana Cellars Viognier 2015 ($22.49) – Lariana Cellars is new to me. They are located in Osoyoos alongside their five acre vineyard, and grow Viognier, Cabernet Sauvignon and Carmenere. Their Viognier is fermented in concrete tanks. Concrete has some natural benefits, such as stabilizing the temperature of the fermentation process, making a smooth fermentation. Concrete is also porous, which allows tiny amounts of oxygen into the wine making process to help the wine breathe. As well, being neutral, it allows the pure flavour of the grapes to come out. This wine was very aromatic. It had ripe stone fruit, leafiness, and hints of orange and honey on the nose. Medium bodied, supple and dry. Light stone fruit, peach, and some leafiness, and also a hint of tropical fruit. Heavier mouth feel. Peppery finish. A quality wine. I look forward to trying their other wines in the future. Stoneboat Piano Brut NV ($17.69++) – An interesting blend of 90% Pinot Blanc and 10% Muller Thurgau grapes go into this sparkling wine, made in the Charmat (prosecco) method. Ripe stone fruit aromas. Dry, but fruity on the palate; lots of stone fruit. Aggressive tiny, creamy bubble. A fun wine. TH Wines Pinot Noir 2014 ($27.79) – Making these wines by hand, the wines from TH Wines are in limited production. Their Pinot Noir has a light, yet intense smoky strawberry nose. Medium body, dry, with medium tannins. Smoky strawberry flavour with a peppery finish. An elegant Pinot. As a media person I was invited to sample a few extra BC wines in a seminar. I am not sure of the availability of all the the wines I mention below, but they did get my attention to showing their terroir. Baillie-Grohman Estate Winery Pinot Noir 2013 – Another emerging region in BC is around Creston, BC, in the Kootenay region of SE BC. If you made it to Yakh, you drove too far east. Their Pinot Noir has a very interesting nose with aromas of violets, tea leaves, dried herbs and meat. Dry, lighter bodied, with a mineral streak. Ripe, juicy purple fruits, strawberries and dried herbs on the palate. Medium minus tannins; enough to give the wine structure. Elegant. Tantalus Vineyards Pinot Noir 2013 – Medium intensity nose, fruity with sweet spices and violets. Dry, and round, with medium body. Light cherry and vanilla flavour. Nice lively acidity, with a firmer tannic finish. A pretty, refined wine. SpierHead Winery Golden Retreat Vineyard Pinot Gris 2015 – Honey, herbs and stone fruit aromas in the glass. Off-dry with medium plus acidity. Ripe and round, with a peppery finish. Stone fruit, pears and pepper on the palate. Balanced elegance. Burrowing Owl Estate Winery Cabernet Sauvignon 2013 – Opaque garnet in colour. Light intensity nose, with dark fruits, and hints of capsicum and cocoa. Medium plus body; soft and silky, with sweet, ripe cassis fruit, red cherries, nutmeg spice, a hint of mint and dark chocolate. A fruity finish with firm tannins. Church & State Wines Quintessential 2013 – A blend of Merlot, Cabernet Franc, Malbec, Cabernet Sauvignon, and Petit Verdot. Medium minus intensity nose. Hints of Old World oak, cedar and red cherries. Medium plus body, soft and round. Dry with medium plus acidity. Juicy, ripe black fruit, nutmeg, vanilla and cedar on the palate. Medium plus tannins and pepper on the finish. Very good quality. Raise a glass to BC wine, and tell your friends.